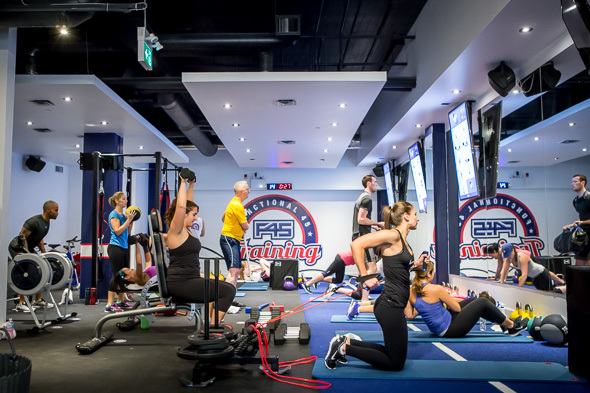 F45 Training is a group fitness studio in Liberty Village that follows a fully interactive group training circuit. It speaks to the popularity of the gym and the effectiveness of the workouts that the gym is packed at 9 a.m. on a Saturday. Or perhaps it's the live DJ we're treated to that actually makes a difference in getting us in the mood for an intense full-body workout. 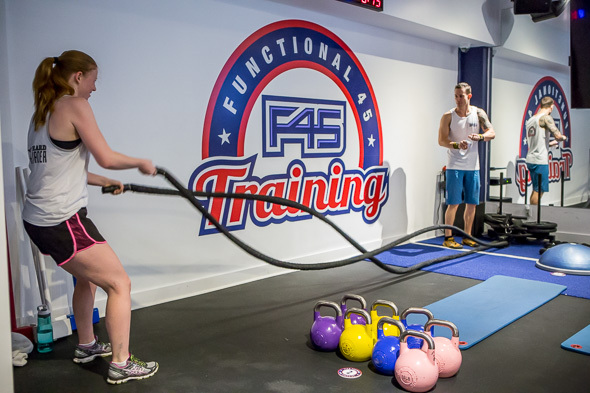 F45 (Functional 45) combines high-intensity interval training (HIIT) and functional training into a 45-minute workout. 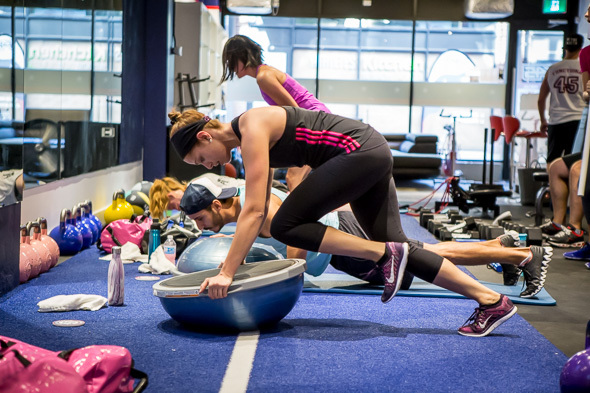 It's accessible for all fitness levels and you can make it as high or low intensity as you need, but come motivated to work and you will undoubtedly break a sweat. 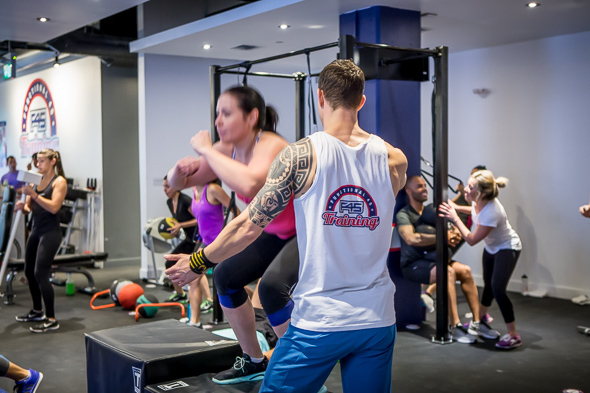 Each workout is displayed which gives the trainer more time one-on-one time with people and allows you to keep up with the moves in each station. The entire workout is more personalized, individualized and guarantees you a new workout everytime. 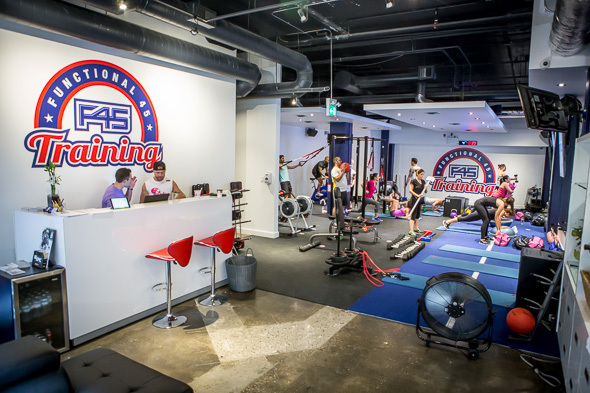 F45 also uses My Zone technology, a program that tracks your heart rate throughout the exercise. You wear a belt around your chest that monitors calories burned and heart rate intensity. I didn't realize this is something I wanted or needed, until I had it clearly displayed in front of me. It motivates you to keep going. There are stations set up for either a cardio or strength set- the workouts in my particular class are 40 seconds long with a 20 second rest. The screens have timers displayed on them, and the circuit is repeated twice for a total of 60 minutes. The trainer demonstrates each move before the workout begins - 27 in total - and she's with us every step of the way for a more hands-on approach to circuit training. The gym is small, and you're going to get comfortable with the person before and after you throughout the circuit, but it's so worth it. I loved the interactivity of the gym and being able to see each move displayed clearly on three different monitors at the front. 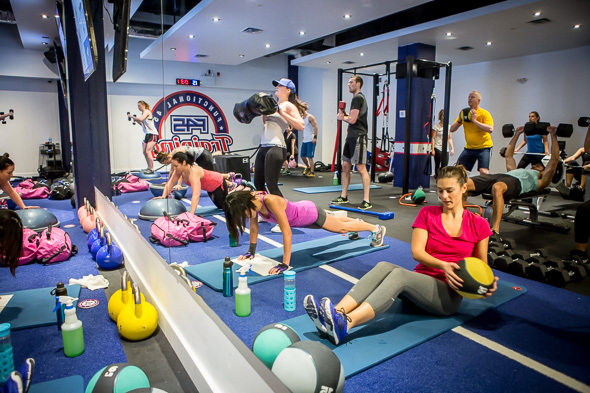 Typically workouts at F45 are 45 minutes and range from boxing and combat, to strength circuits. "You never get comfortable and it's always changing," says Jarrett Slaney, one of the owners of F45 along with Paul Smith. 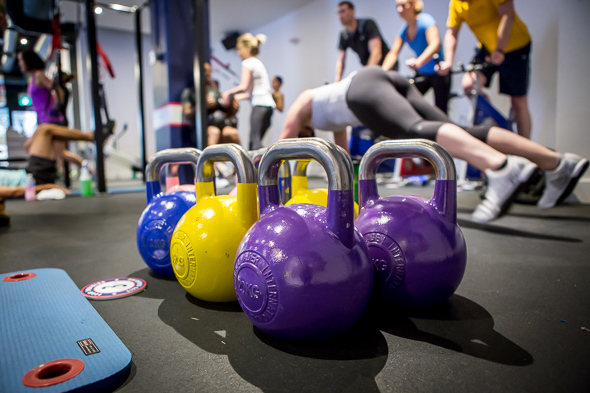 The F45 training concept originated in Australia and became so popular that it now has 200 locations in 16 countries. 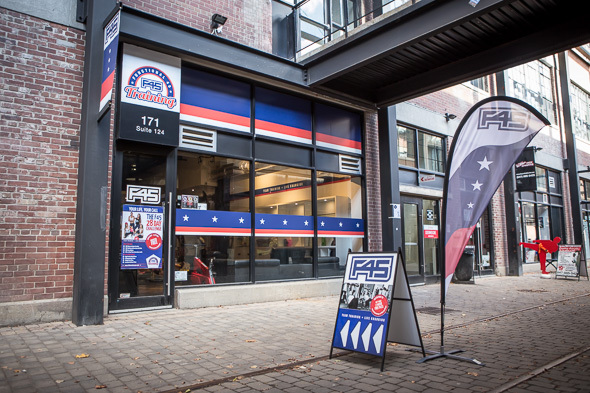 F45 Liberty Village is the first one in Canada. 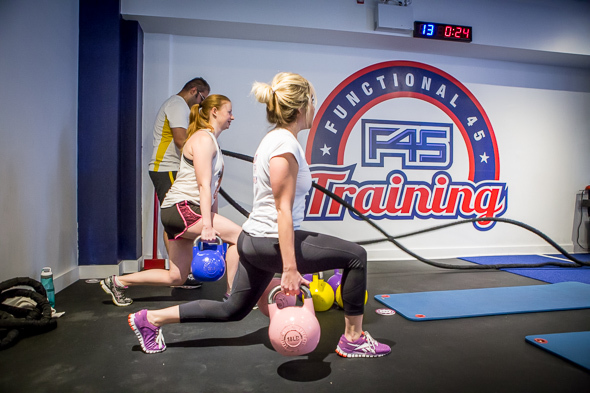 After living in Australia for a year, Slaney was introduced to F45 functional training and saw how it was taking over the fitness industry in Australia. 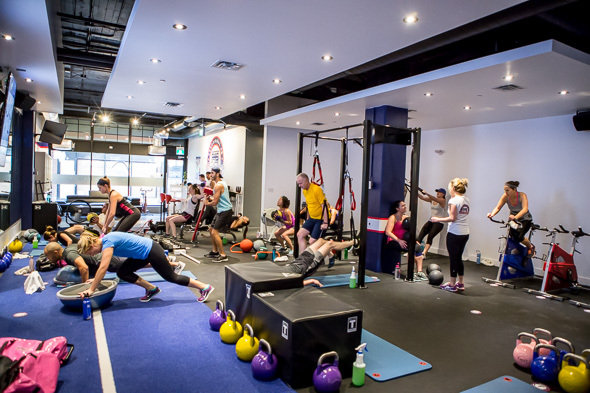 After speaking with the founder of F45, Slaney and Smith decided it was an amazing product to bring to Canada, and opened the first gym to an overwhelming positive response from fitness enthusiasts. There are three different workouts - Athletica, Romans and Hollywood - each used to target aerobic fitness, muscle endurance, strength and flexibility and Hollywood which is a combination of Athletica and Romans. I can easily say this is one of my favourite workout studios. The people in my circuit were friendly and so encouraging throughout the one hour that we sweated and trained together. 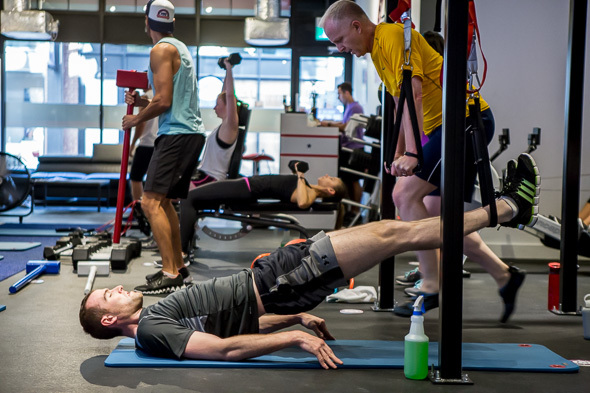 The trainer was attentive and pushed us to experience a deep workout while fixing and correcting our posture, or suggesting different weights depending on what our bodies could handle. The hour went by fast, and I don't often feel that way about hour-long strength training exercises that test and push your limits.